OldHome - Think global. Hack local. Maybe you're not the type to answer the phones at a crisis hotline or grab a hammer and help build a house for a family in need. That doesn't mean you don't have ways to make a significant contribution in your community. Non-profit service organizations in the Lower Mainland need software solutions to various problems in order to better serve their constituents. They could pay for those solutions, but that's money that could be spent in other ways. That's where you come in. 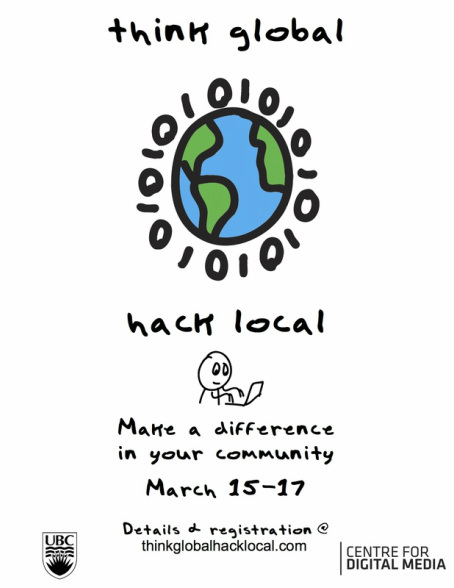 If you have software skills and a desire to make a difference, come join us at our community hackathon from Friday, October 25 to Sunday, October 27. Representatives from local service organizations will pitch their projects to our student developers Friday evening, the students will select the projects they want to work on, and then it's a weekend-long drive to create something amazing for our non-profits. You'll get to sharpen your software development skills, you'll meet like-minded students, you'll end up with a story and some software that might impress prospective employers, and best of all, you'll be helping out in a way that only hackers can. But wait, there's more: we'll feed you for 48 hours too! If this sounds like how you want to spend a weekend (you can study later, right? ), register here now. Please join us. We look forward to seeing you.